KIA soldiers from (5) battalion occupied Taung Ni village which is on the way of Mogawng and Monyin rail road, it is under KIA’s (2nd) Brigade area on 29th December, according to the KIA front line officer report. 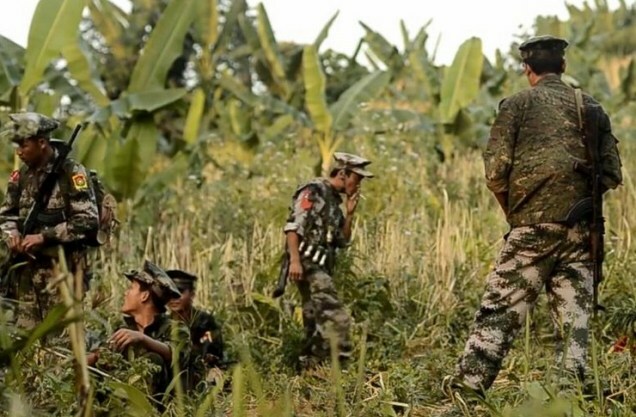 Moreover, KIA alarmed all the Kachin ethnic people to insist in wherever the invader Burmese Government military because the Burmese Government made genocide war on the Kachin ethnic people. စားစရာမရိွလဲေျပာေပါ့ ကခ်င္ျပည္သူေတြေကြ်းမွာ ေပါ့ .. ေနစရာမရိွလည္း ေနစရာေပးမွာ ေပါ့ ကခ်င္ျပည္နယ္က အက်ယ္ၾကီးဟာ .. ထမင္းေကြ်းတဲ့ အိမ္ရွင္ေတြကို ေတာ့ ေက်းဇူးမတင္လည္းရတယ္ မေစာ္ကားပါနဲ႔ ..